Who Says Slacker Heroes Can’t Succeed? THE BOUNCE #5, written by Joe Casey and drawn by David Messina, has sold out at the distributor level. THE BOUNCE stars Jasper Jenkins, just your average, twenty-something guy who gained his powers though surreal circumstances. When he's not hanging out and doing a lot of nothing, he puts on a costume and hits the streets as the Bounce, a superhero in a world that's not used to super-powered heroes and villains. Jenkins may be a slacker superhero, but THE BOUNCE is loaded with depth, as Casey and Messina explore what would make a person put on a costume and fight crime, the pressures of modern identity politics, and even some good old-fashioned superheroic action. "I'm feelin' all warm and fuzzy inside knowing that we've got a dedicated readership out there who seem to be as invested in buying this series as we are in creating it every month," says Casey. "And the surrealism of this thing is just getting started. There's still plenty of secrets yet to be revealed." "Joe Casey pens the script and from the first page to the final panel he sets out to challenge his audience. By using a confrontation that results in an overreaction then a fatality he lifts a magnifying glass over the strengths and fears of Jasper Jenkins. It’s hard not to relate to the story, as crazy as it is, because the scribe does an amazing job delivering organic dialogue that feels innately human." "But overall, this where much of the brilliance and enjoyment of The Bounce comes from–its ability to mix the two worlds of superheroics and social commentary so well, a microcosm of the larger scale issues that it addresses in its pages. In many instances, it demands second–and even third–readings to appreciate its nuances... the Bounce is indeed like Spider-Man for a new generation, only with a far more nuanced social conscience and understanding of the complexities of wanting–but not being able–to just be who you are at all times without fear of reprisal." THE BOUNCE #5 may still be available in your local comic store and is available digitally on the Image website (imagecomics.com) and the official Image Comics iOS app, as well on Comixology on the web (comixology.com), iOS, and Android. 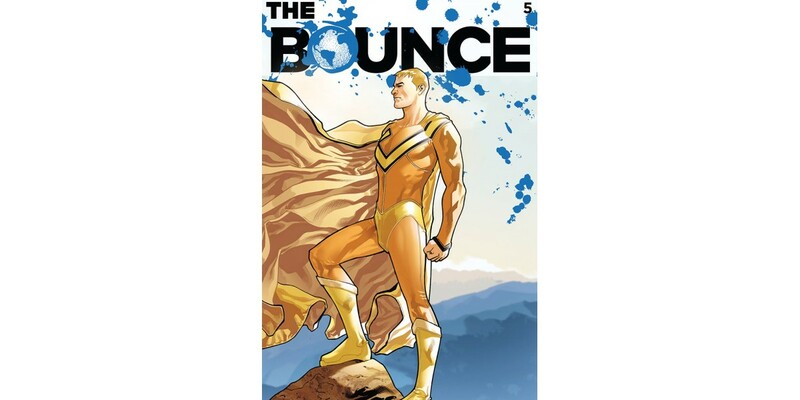 THE BOUNCE #6 releases 10/23 and can be pre-ordered now (Diamond Code AUG130687).